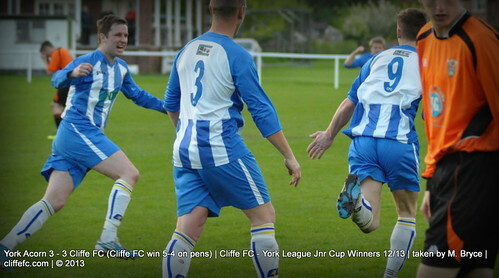 FT: York Acorn 3 – 3 Cliffe FC – Cliffe FC win 5-4 on penalties. 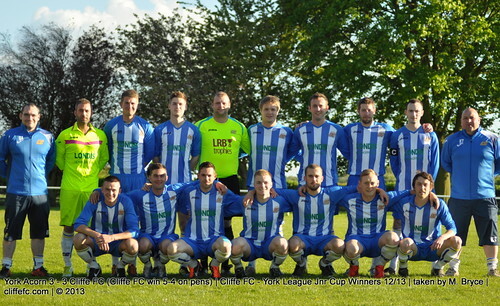 Cliffe FC win the York League Junior Cup on penalties after an eventful game which saw the scoreline 3-3 at full-time, Dave Laverack and Nathan Parker the shoot-out heroes. ~ Keith Tiplady, 23rd May 2013. The tie started with both team seeming to show some nervous energy, although Cliffe came close first with Paul Tanton having a half-chance cleared from almost under the crossbar near the 10 minute mark. It was Acorn that took the lead after Kev Taylor was penalised for a handball in the box, Acorn slotted the penalty away left-footed to take the lead, 1-0. Acorn who have scored near over-130 goals this season always were going to be a threat coming forward and they pounced on a defensive error to extend their lead to make it 2-0 with not much left before half-time. The score at the interval did read 2-1 when Tom Hogg capitalised on a lack of communication between ‘keeper and defender and forced the ball into the net before the half-time break, 2-1 HT. Keith Tiplady’s men had 45 minutes to put it right and started the second-half brightly – Hogg crashing an early effort agonisingly off the inside of the post. Again, slight hesitation whilst defending a corner saw Acorn regain their two-goal cushion, scoring inside the box to make it 3-1 and looking a tough way out for Cliffe. A massive moment in the game saw Acorn reduced to 10-men after a Acorn defender lunged dangerously and caught Billy Atton right in front of the assistant referee, straight red card shown and about half-hour left to play. Chris Jackson had the ball in the net, but it was ruled offside – however his next effort ten-minutes later wasn’t and he reduced the arrears to one-goal tucking away a close range effort, 3-2. The inevitable Cliffe attacking wave came, although Acorn still retained their threat on the counter. Cliffe could have seen themselves go ahead in the game had it not been for the growing display from Acorn’s #1 – making close range saves from Hogg, Ian Beckram and substitute Lee Carter. Beckram growing more and more into the game eventually had his say, breaking down the left wing and unleashing a shot past the ‘keeper to send the Cliffe ranks into raptures, 3-3 with still time to search the all important seventh goal of the game. The 90 minutes ended with the scoreline 3-3 and the game, as per competition rules, went to penalties, 3-3 FT. Both sides tucked away the first eight penalties for 4-4 but a strong save from Dave Laverack – who elected to wear no gloves for the shootout – gave Nathan Parker the opportunity to win the Cup with the tenth spot-kick – Parker tucked the penalty away confidently to see Cliffe FC crowned York League Junior Cup Winners 2012/13! 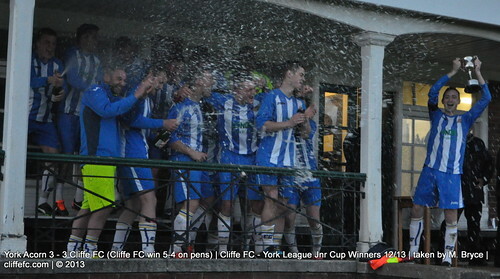 A positive end for a testing season for Cliffe FC first team – the togetherness and team mentality shown in the final rounds of the League Cup in the final month or so a massive positive – something the club will be looking to build upon next season. Cliffe FC first team and Reserves now can look forward to Saturday’s charity match and their annual Awards Presentation. Laverack, Atton, Tanton, Parker, Dickson (Carter), Durnin (C), Pearce (Harkin), Beckram, Taylor, Hogg (Kirkham), Jackson. Unused subs – W. Pears, A. Harris. 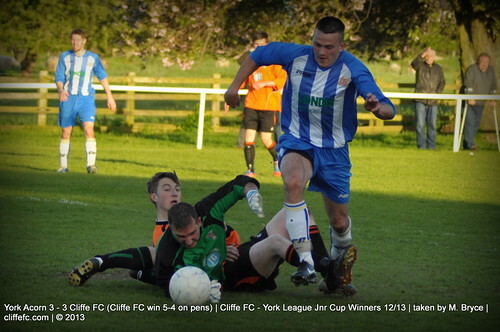 Cliffe FC Goals: Hogg, Jackson, Beckram. Cliffe FC MOTM: Tom Hogg.